After the painful experience of reviewing Neil Young’s new cover album, Americana, we decided to go back to some of our old favorites, and create a list of the top ten cover albums. It was surprisingly difficult to find a comprehensive list of cover albums that have even been released, so I am certain we are missing a couple of classics, but also was very happy with strength of the list we came up with. Another couple items of note is that the album needed to be 75% covers to be considered and a lot of 1950’s and 60’s albums were not considered. A lot of early Beatles, Rolling Stones, etc. albums were comprised mostly of covers because that’s just the way the music business was run back then. Somebody would have a minor hit, then ten artists would cover it to bandwagon and try to copy its success. So what makes a great cover album? There are a lot of opinions on that, but we firmly believe it is not enough to simply mimic already great songs. What we like to see is an artist keep the feeling of the original but substantially change the arrangement. Also great is when an artist manages to rescue a song from obscurity and make it completely their own. There is not absolute formula to a great cover song or album, but as with most of our list the following selections hit us the hardest. On to the list. Bowie’s lat album with The Spiders from Mars was a tribute album to some of his favorite tracks from the 60’s. 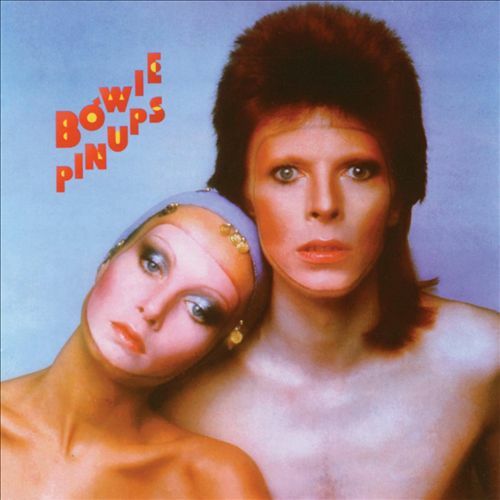 Pin Ups contains classic songs from The Who, a lesser known track from Pink Floyd’s most underrated era, a Kinks track for the ages, and some lesser-known bands that I probably would have never been turned onto otherwise such as The Pretty Things and The Easy Beats. All of these things fused with the Bowie twist means it is a sure-fire instant eargasm. Little by Listen Create a free website or blog at WordPress.com.